A few weeks ago, I sat in on a language arts team meeting led by our language arts coach, Omaura. 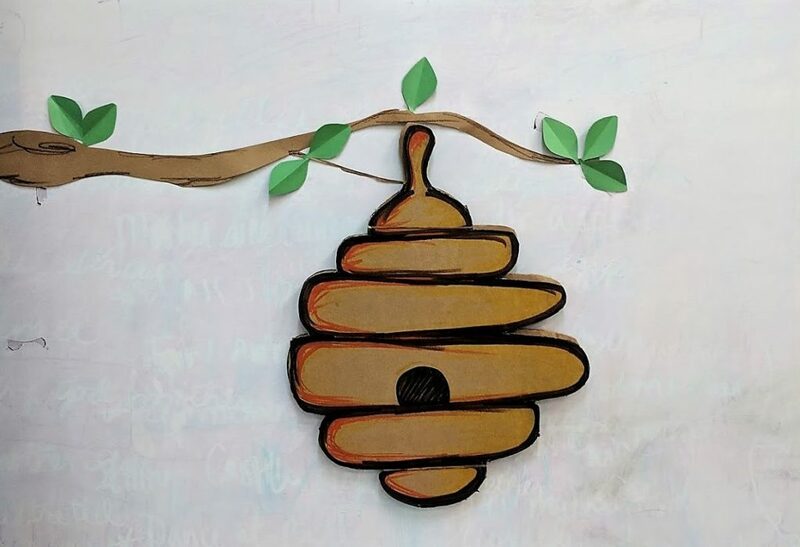 Since her goal that day was to show teachers how to “create a buzz” in their classes, Omaura modeled the process for them rather than simply explaining what they could do. Omaura put up instructions for an activity. 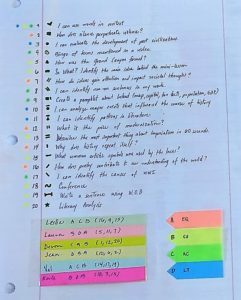 She wanted to reinforce teachers’ understanding of the difference between essential questions, checking for understanding, activities, and learning targets. Next, she opened the hanging beehive and showed the teachers that the hive cells were different colors. 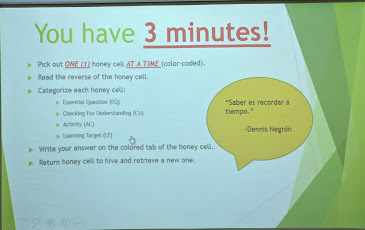 Each teacher was to work with the cells that were the same color as the homework instructions found on their bee — each teacher’s bee featured a different colour. They were to take a cell, go to a table, write the answer to the question on the cell, and then return the cell to the hive and take another. Omaura explained that although some cells would seem like learning targets, they were actually just description of activities (rather than skills being taught). Their job was to identify them correctly. After the activity, Omaura gave each teacher the three hive pieces that belonged to them and asked them to read the question on each one to the group, say how they categorized it, and explain why. A rich discussion developed about the categorization of certain examples. Depending on the teacher’s objective, some activities could have different purposes. 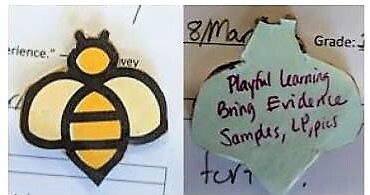 Teachers said the bumble bee they received made them curious about what would happen the next day. Omaura told them that a pre-activity can help to fire up students’ interest, curiosity, and excitement about a lesson. “As teachers, we should work on changing things up, making lessons fresh, and creating a buzz,” she said. Using instruments, song, rap, or poetry to present knowledge or facts. Painting (or any art form) used outside of an art lesson. Designing and filming a television ad. Food — for instance, cooking up a Mayan meal together as a class when learning about the Indigenous people of Mexico. 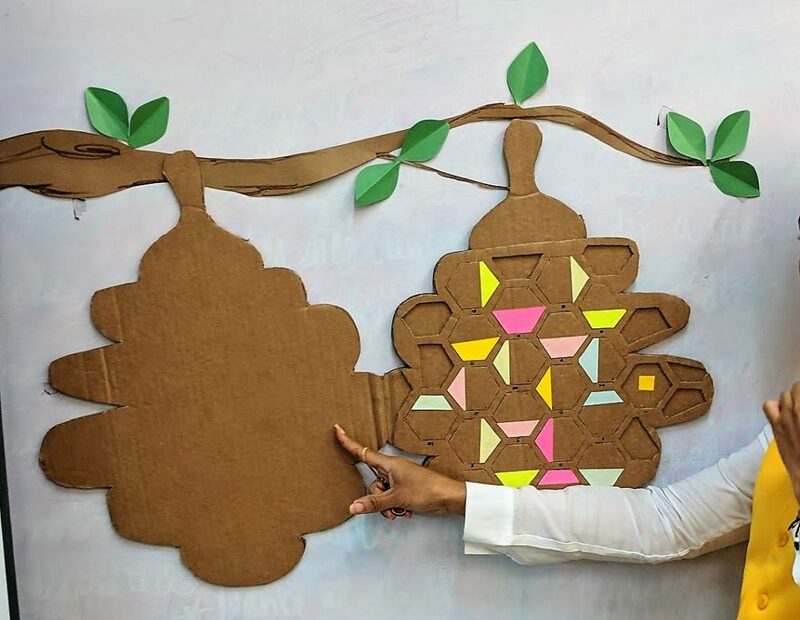 To wrap up the activity, Omaura asked teachers to take out their homework assignments (which had been to collect evidence, samples, or pictures of playful learning). She had tables set up and told teachers they would share their classroom play examples in a speed dating format. They sat down, ready to go. She set the timer for three minutes and then let them share their ideas with each other. When the timer went off, they switched chairs and shared with the next person. It was a fast, fun, motivating activity with plenty of learning. Omaura finished up the workshop by asking teachers to think about different ways they could incorporate games and novel activities into their lessons to create a buzz in their classes. 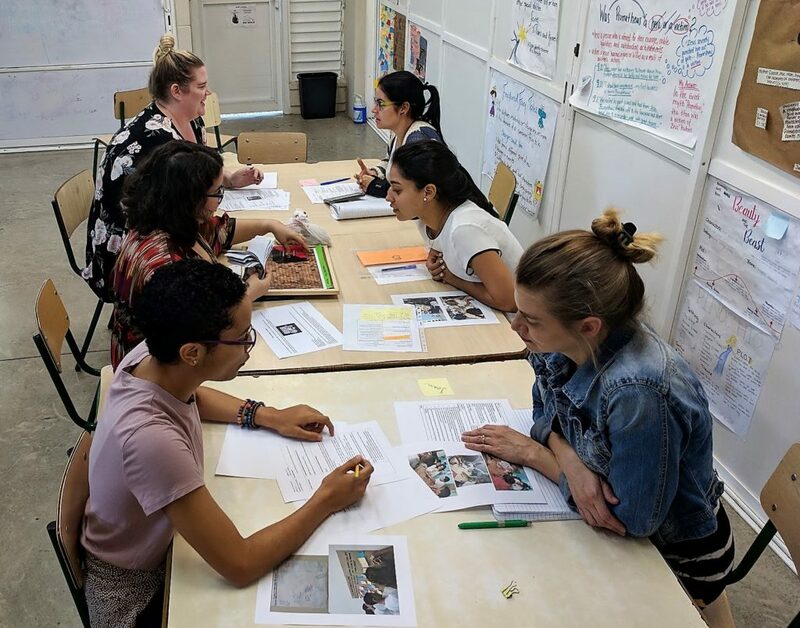 She told them that the following week they’d be pitching their ideas and preparing their activities so that in the first two weeks of April there’d be a real buzz of excitement in all the language arts classrooms. Now it’s April, and I can assure you the entire secondary school is buzzing! But I’ll save that for another post… for now, let’s learn from each other — in the comments, please share ways you stir things up and create a buzz in your classroom. 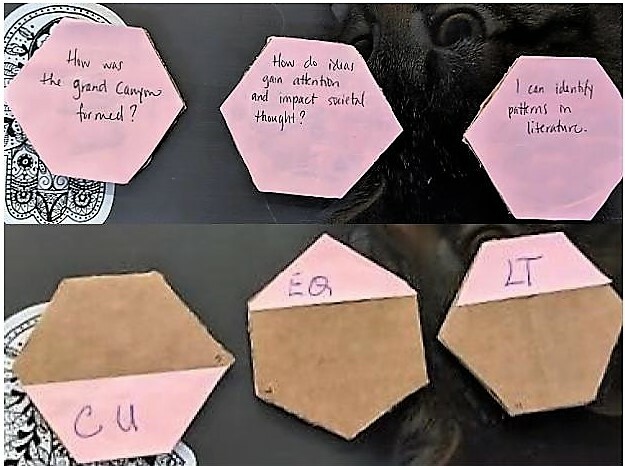 Love this and would like to use it with secondary staff —would/could you share your templates and statements that you had on the cells so that I have a better grasp of things you had on your hive for teachers. I’m thinking of maybe focusing on teachers’ classroom assessments. I would like to hear your thoughts of trying this with this topic. HI Kathi. This is not my class – I observed our amazing LA coach, Omaura, work with our language arts team. If you zoom in on her colour coded checking for understanding sheet above, you’ll see all of the statements that were on the hive cells. I think this would be a great activity for working with classroom assessment. If you’d like, follow me on Twitter @carlameyrink, then DM me and we can discuss possibilities.